That's an inflammatory title, and yet in the context of geology it is quite literally true. The land in today's picture is indeed broken, and was the scene of unspeakable violence 760,000 years ago. If such an event were to recur, it's a fair bet that civilization could end up in danger of collapsing into unrecoverable chaos. Yellowstone National Park gets a lot of attention for being a "supervolcano", and numerous TV documentaries fan the flames of concern about the possibility of a giant eruption in the midst of our country. It's quite true that a full scale explosion like those that have happened three times in the last 2.1 million years could wreak havoc on a wide scale, but Yellowstone hasn't actually had an eruption in 70,000 years. The proper geological name we geologists use for a "supervolcano" is rhyolite caldera. This works a little better because these calderas are not volcanoes in the normal sense of the word. They are gigantic holes in the ground caused by the collapse of the crust after vast amounts of magma are blasted into the atmosphere. 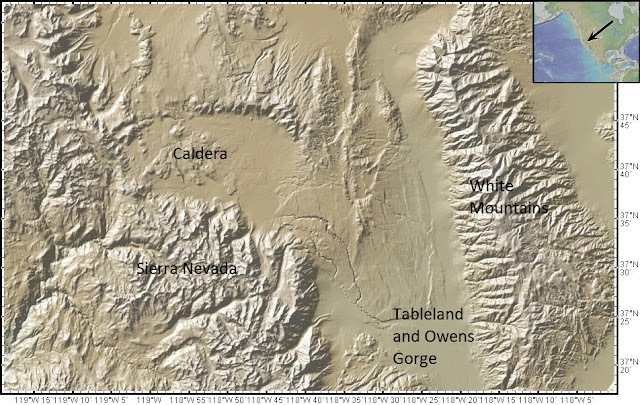 Some calderas were singular mountains at one time (like Mt. Mazama, which collapsed to form Crater Lake in Oregon). Others weren't. They were volcanic centers that included a collection of smaller cones and lava flows. The collapse of giant calderas seem to begin with smaller eruptions that grow in intensity over a time scale measured in decades or centuries. That's why Yellowstone caldera is of somewhat less concern to geologists (that's not to say that lesser eruptions aren't impossible). What is less known to many is that we have more than one recently active rhyolite caldera in the United States; we actually have three. I got a close look at the other two on my plane flight in December. 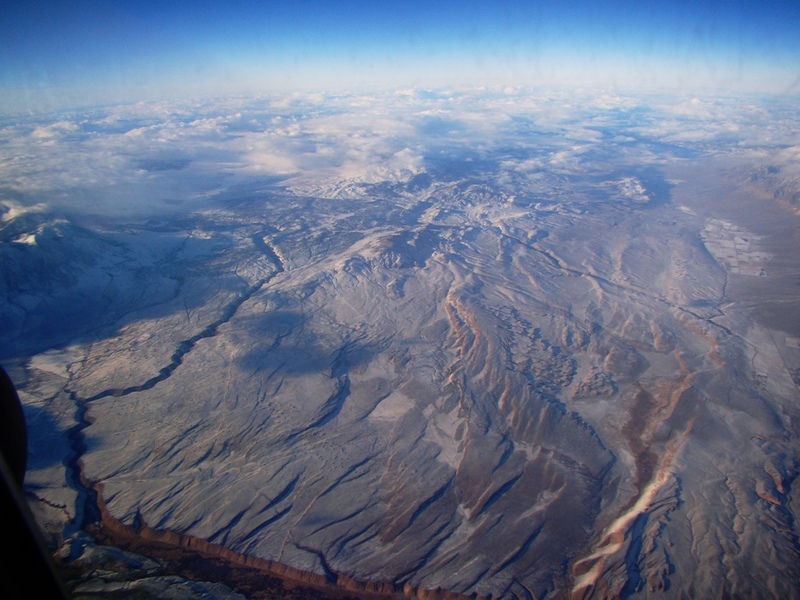 My flight took a more southerly route than past trips, and as we crossed the crest of the Sierra Nevada, I realized I was flying directly over the north end of the Owens Valley and the Volcanic Tablelands. The Tablelands are the southeastern flank of the Long Valley Caldera, California's version of a "supervolcano". And if anything, it's more dangerous than Yellowstone, if for no other reason than the fact that volcanic activity is ongoing, even though gigantic eruptions like the one that rocked the region 760,000 years ago are unlikely. The caldera itself was obscured by clouds, but I had a perfect view of the Tablelands, a region adjacent to the caldera that was covered by 400 feet or more of volcanic ash that was so hot when it landed that it welded itself into solid rock. The pink colored rock is called rhyolite tuff. 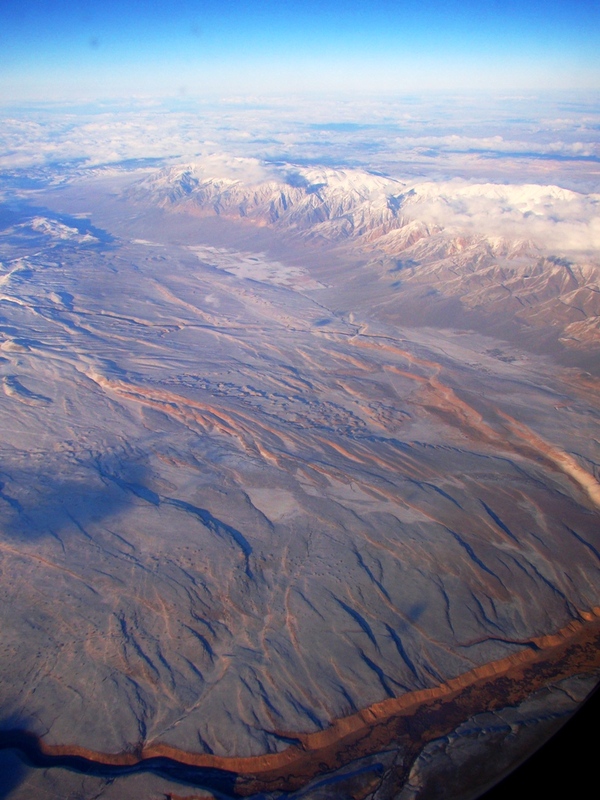 The tuff from this eruption is called the Bishop Tuff. The scale of the eruption is hard to imagine. For perhaps a week, huge explosions blew ash into the stratosphere. Not a little bit of ash; it amounted to around 150 cubic miles of ash. The ash buried the local landscape under hundreds of feet of hot steaming rock, while some ash deposits have been found as far away as Kansas and Nebraska. The collapse of the caldera was a stupendous event as well. The hole was around 20 miles long and 10 miles wide, and as much as 1-2 miles deep (much of the caldera was filled with ash during the eruption itself as the ash column collapsed downwards). After 760,000 years, it is still plainly visible in satellite imagery and topographic maps (below). 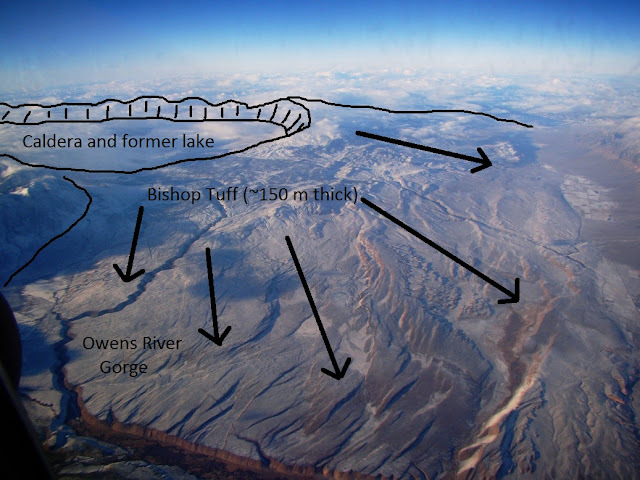 After the eruptions ceased, water started to fill the caldera, eventually forming a 1,000 foot deep lake. The lake ultimately breached the margin of the caldera and rapidly carved a gorge hundreds of feet deep across the western edge of the Tableland. The walls of the Owens River Gorge expose a fine cross-section of the rhyolite tuff, allowing geologists to work out the sequence of events during the eruption. The Tablelands provide a window into the tectonic environment of the region. By covering the slope like a thick blanket, the tuff provided a blank slate on which post-eruption faulting can be easily seen and analyzed. There are dozens of faults, mostly trending north or northwest, with scarps that face west (the sunlit terraces) and east (the shadows). Geoblogger Callan Bentley provided a marvelous grounds-eye view of these faults in this post on his old NOVA Geoblog (Callan is now blogging primarily at Mountain Beltway under the auspices of the American Geophysical Union; he's always posting something interesting). There is a much more extensive example of the broken nature of this landscape. The prominent mountain range on the upper right of the picture below is the White Mountains. In any other setting this mountain range would be a national park, but lying east of the Sierra Nevada, it sort of loses out. It tops out at 14,242 feet, rising as much as two miles above the adjacent Owens Valley. It is a gigantic fault block that formed when the land that is now the Basin and Range province began stretching and collapsing, forming a series of horsts (mountain blocks) and grabens (faulted valleys). The mountains lie in the rain shadow of the Sierra and never formed glaciers of any great extent. The highest arid slopes play host to the most ancient life on planet Earth: the Bristlecone Pines. The oldest Bristlecone is 5,062 years old. The Whites are a fascinating (and lonely) place to visit. The Airliner Chronicles is one of my on-again/off-again serial features, which is usually updated whenever I fly somewhere. So awesome to see it from this perspective! Ah, glad the White Mountains aren't a national park; In Death Valley NP they threaten to shoot you if there's a rockhammer in your hand. In the White Mountains east and south of Owens valley there are a lot of canyons and and a lot of geology to explore, much of it Paleozoic. Some of it fossiliferous. Places where limestone and dolostone form racing stripes. Wonderful place. A Maybe Not So Hard Quiz...Where Are We?